Fiona Egan, founder of the phenonemnally successful fitness franchise sásta, has been recognised at the National Franchise Awards, beating off competition from The Zip Yard, Jymka and Snap Printing. 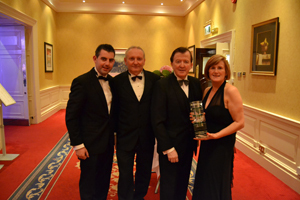 The prestigious awards ceremony, which was held at the Clyde Court Hotel in Dublin last Friday proved a glamorous showcase for the very best of Ireland’s franchise personnel and businesses. Ms Egan said of her award: "It is a fantastic feeling to be recognised on a national stage and to see my dreams of owning my own business finally see success after so much hard work put in by myself and my fabulous team." The award comes for revolutionising an entire industry within Ireland through the implementation of special fitness pods that make exercise as much as four times as effective. Sásta is planning to open 20 new outlets throughout the country over the next 18 months, which will create more than 100 jobs in Cork, Galway and many more towns and cities. Fiona and her team are planning to build on this success and are already looking at expansion into France, Spain and the UK.